A popular Beverly restaurant opened an outpost in Arlington Center 2 weeks ago. They serve a small menu of burritos, tacos, quesadillas and tortas. The space is tiny, with tables lined against both walls; I imagine they aim to do a lot of take out. I might need to make a rule that says no going to restaurants during the first month of opening. Bagelsaurus was a disaster and after waiting over 35 minutes for my lengua (beef tongue) burrito, I decided to give new places some time to work out the kinks. 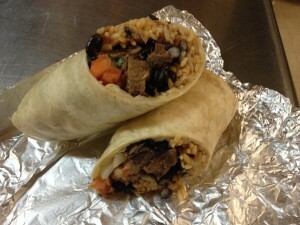 The 12" burrito was good, not great; the meat was tender, but not very flavorful. $5.50 is a reasonable price, but they do charge an extra .50 for sour cream, cheese or guac. I liked it enough that I will return here for a torta (6.5) when the lines die down and they learn to manage their kitchen better.